Today was a great gliding day. A number of members had some excellent flights. There was some great patches of lift but along with this there were also some patches of heavy sink. Mike had an hour and 20 minutes in the single making it out over his farm at Childers. Jim, after a check flight with Leigh found good lift around the field and made it to 5900. He said he had troubles getting down having to revert to pulling the air brakes to make it to the circut. Leigh also had a good flight in the single. Yes Sunday was a great day. Not that I can claim it but I made it to Biggenden and back, Silver C Distance. Attached is the money shot looking back to the field, not that you can see it. 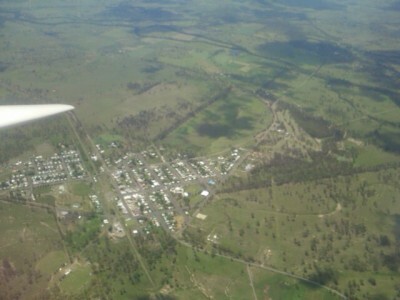 I took off around 12:00 and headed for Childers Airport. Got to 5,000 there and thought I would poke west to see what it was like. There seemed to be plenty of clouds and they were producing some good lift. Although as the saying goes what goes up must come down and there was some heavy sink between the clouds. Abeam with Mt Gonanaman (Not sure if that is the right spelling) I was still between 4000 and 4500, I could see Biggenden so decided to go for it. A couple of thermals later I was there and could see the airstrip which gave me a little confidence. At 4,700 I decided to head north towards Wallaville. I could see the Paradise dam to my left and thermaled around Boyal for a while to get some height back. Looked for the airstrip that was marked on the map but lost an eye looking. Made it to Wallaville and could see the Abbotsleigh strip so felt comfortable again. I didn’t head to Gin Gin as it was all in the blue and I knew there would be heavy sink there so followed the clouds north and climbed back up to 5000 halfway between Gin Gin and the Walla Weir. After hitting the cloud base I put the stick forward and headed back to the field. Hit one more thermal on the way, practiced a few spins and stalls and made it back to the strip about 15:00. There was another could and the single was being towed off the strip so I thermaled back up to 5000 and skooted around cloud base for a while making up the side of a cloud to 5600, the highest I had been all day. I practiced side slipping to get down and landed at 15:18. It was a great day full of cross county experience. Now I just need to get the gear to log another flight to be able to claim my Silver C Distance. Looking forward to seeing some other members going cross country.